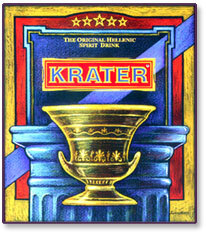 Ouzo Mavrakis. 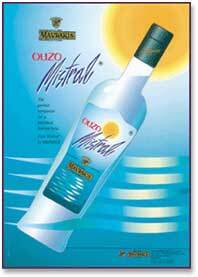 Greek Distillery produces ouzo, brandy, liqueur. n the year 1864 VAS.MAVRAKIS founded the renowned distilleries in Argos bearing his name until today.The original extracts and liquers -which soon became synonyms to good quality and taste - were created and produced here from carefully picked varieties of grapes and fruits of the local yards using the traditional ways and a "know how" that lends its roots to the Homeric times.Today the fourth generation of the family continues faithfully the inheritance of producing with unquenced zest our fine and fully matured quality of Ouzo, Brandy and Liquers. he great care goes with each and every one of the MAVRAKIS products starts with the scholatsic selection of the raw material moves on to the diligent distillation and continues with unsparing allowance to mature and the fine blending in oak tree barrels for the Brandy and appropriate containers for the Ouzo where the final checking and tasting is performed.The MAVRAKIS distilleries use the old recipes as well as the modern technology in order to deliver to the consumer only products that do justice to a tradition of 134 years and satisfy the finest taste requirements. he MAVRAKIS distilleries also produce a wide range of liquers to satisfy even the most demanding client and taste. Mavrakis distillery liquer collection includes the traditional tastes of 'Teinture' and 'Mastic', two exceptional liquers served on ice, as a shot or in cocktails along with all other popular tastes like Coffee, Cherry, Triple Sec, Rose, Banane, Coconut, Maraschino and Menthe. ll our products are available under our own label, as private label and can be bottled in our factory at a capacity and rate capable to meet high demand. Our products are successfully placed in European and North American markets with great success.As we always look for new adventures and new markets we are open to discuss Business opportunities in all markets. We currently focus on European and South Asian markets and we seek to develop long term business. Click at 'Contact' link to view some of our products and at 'Contact' link to contact us.